The immigrants that President Donald Trump would deny entry have stories not so different from the stories of immigrants throughout American history. Sosna Beveng has a graceful smile, a soul-lifting laugh and a teasing, gentle manner that my elderly father does not want to cross. For several months, this certified nursing assistant has occasionally been helping care for Dad as he has recovered from some surgeries. For our family members, she has been a part-godsend, part-miracle in challenging times. Eighteen years ago, she emigrated with her 6-year-old son from Eritrea on the Horn of Africa to escape unrest and economic upheaval caused by war. She took classes and became a certified nursing assistant, deploying that disarming superpower of hers to care for ailing patients. Hers is an American story, unique but common at the same time. Many people have similar stories in their family trees — ancestors leaving difficult political circumstances or oppression, abject poverty, religious persecution or limited opportunity. The exceptions, of course, are those brought to our shores as slaves as well as Native Americans. 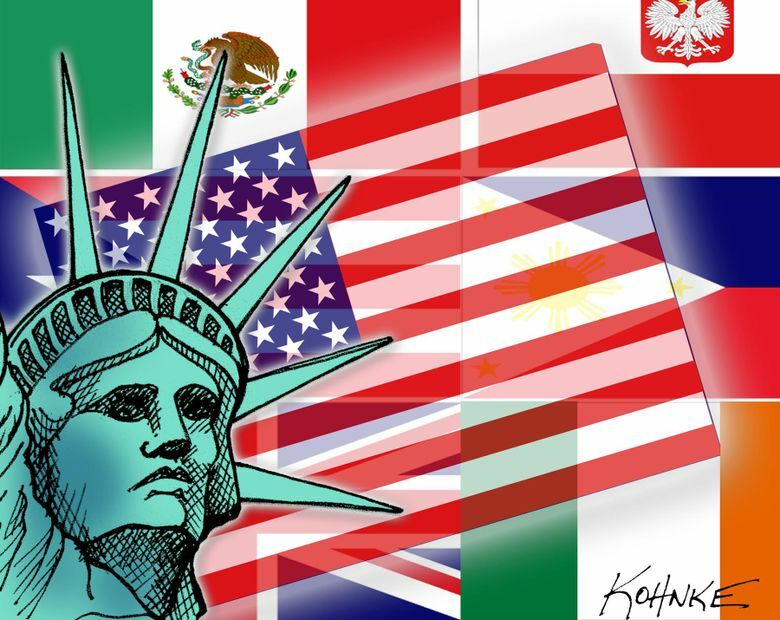 America’s immigration stories are diverse, but the common objective is a better life. And this land has benefitted richly. The economic power of immigrants fueling innovation at Microsoft or Amazon, opening sublime ethnic restaurants, working in construction, heath care, cutting asparagus or harvesting hops cannot be denied. Sosna was on my mind last week as President Donald Trump continued his callous campaign of animus against immigrants, often using dehumanizing language to justify his backward policies. He has dismissed Mexican immigrants as rapists; he has sought to ban people from Muslim countries. He expressed a preference for Norwegian immigrants over those from “shithole countries.” Last week, he spoke about undesirable immigrants “infesting” America. But also last week, citizens and leaders from across the political spectrum rose up in anger to pressure the president to relent in his administration’s mortifying policy of separating children from their parents illegally crossing the U.S. border with Mexico. Faith leaders sermonized and congregations demonstrated; Washington and other states sued the feds over his policy. Trump’s language distracts from desperately needed comprehensive immigration reform — to help the Dreamers, yes, but also workers, from the fields to high-tech. Congress has failed utterly, through Democratic control and Republican control, to fix our broken system. That means acknowledging the federal government’s malignant neglect that fostered an underground labor market that is now an underpinning of our economy. That means bringing people out of the shadows, with a path to citizenship. But Trump has set it all back. Barón, who immigrated to the U.S. from Colombia as a 13-year-old, is a U.S. citizen. Although his family had resources, he has never forgotten the sense of being different, not able to speak English and the kindness of teachers and others who helped him. It is what drives this Yale-educated lawyer’s work now, leading a formidable nonprofit that advocates for immigrants’ rights. When he met with some of the mothers at the Northwest Detention Center who had their children taken from them, he was unable to tell them what to expect. Some of the women had been detained for a month without an interview. Several of my ancestors came from what would have been considered “shithole” countries in the mid-1800s, including ethnic Kashubians escaping religious persecution in Prussia. My third-great grandparents John and Margaret Dunn of Geashill in central Ireland survived the Great Famine, which killed more than 1 million people in the late 1840s, but John died in 1856. Three years later, the widow Dunn packed up her eight children, ranging in age from 4 to 19, and boarded a ship for America, according to family history. Sadly, Margaret died at sea, and the orphans went to work in the textile mills around Pittsfield and North Adams, Massachusetts. But, in the generations that followed, the family’s lot improved. The Dunns’ descendants were farmers and pharmacists, doctors and nurses, teachers and a researcher — and a South Dakota state senator for 30 years. A forlorn beginning, to be sure, but a common American story of aspiration. As for President Trump and his abhorrent views of immigrants, many of the families who have “infested” this country, whose values he seeks to undermine at every turn, stand as testimony that he is wrong.